How Much Wood Could a Woodcutter Cut? Evidence of human desire to leave a mark upon the material world has existed as art since the discovery of cave paintings created 35,000 years ago. Techniques and style vary from culture to culture, but art acts as a keyhole allowing glimpses into aspects of the contemporary society. Social, political, and economic factors influence the production and content of artwork throughout periods in history. Ancient Japan employed pottery as an early and practical art form but as society became increasingly sophisticated so too did its reflection in artwork. One of the most renowned types of art produced in Japan is the woodblock print, which reached its Golden Age in the Edo Period of 1600-1868 with the production of ukiyo-e, pictures of the floating world. The term ukiyo can be defined literally as floating world, a Buddhist concept referring to the transient pleasures of material existence and e, the everyday pictures captured in printed woodblock form (Addiss 95). This paper will examine the history of the woodblock technique, the evolution and content of the ukiyo-e, and the internal and external impact of the ukiyo-e movement. The technique of woodblock printing can be traced to simple wooden stamps used to make impressions in clay and wax in ancient civilizations. With the invention of paper, stamps flourished into woodblock prints becoming an intricate process often used for illustrations. Woodblock printing is a method of relief printing in which the image carved into the surface of a wooden block is transferred to a sheet of paper. The process is traditionally a three-person succession. First the artist makes a design on thin semi-transparent paper, which is pasted face down on a woodblock. Next a carver cuts and chisels away the surface of the design forming a pattern of raised lines and depressed solid areas. Finally the printing specialist applies ink to surface of the woodblock over which paper is placed and pressure applied with a baren, or disk shaped pad. The raised surfaces transfer ink from block to paper creating a negative image (Yoshida and Yuki 25-27). The dissipation of woodblockng throughout Japan is not only linked to China and the introduction of Buddhism but also a factor for its speedy dispersal. The oldest example of the art dates to 770 A.D. with the use of a single block to produce Chinese characters in a scripture known as “Hyakumato Dharini” which was made at temples and distributed to believers. Towards the 11th century picture prints begin to appear in copies of Buddhist scripture illustrating deities and sacred scenes. The relatively inexpensive mass reproduction process was pivotal in the availability and circulation of Buddhist texts and illustrations. According to authors Yoshida and Yuki, woodblock remained a religious tool for centuries and "It is possible to say that for a long time—or, more precisely, till the beginning of the seventeenth century--the art of woodblock printing in Japan was used for no other purpose than that of religious propaganda" (Yoshida and Yuki 19). However beautiful illustrations were, woodblock prints were largely ignored until the beginning of the Edo period (1600-1868). In 1600, after years of bloodshed between feudal rivalries led by Samurai officers, the Tokugawa emerged victorious at the Battle of Sekigahara and reunited Japan ending the Sengoku. The subsequent 268 peaceful years of Tokugawa rule can be strongly characterized by the shogunate government and a policy of isolationism allowing for a unique development of culture (Kita 28). The Tokugawa established Edo (Tokyo) as the capital of Japan and were so strongly identified with it that this period is referred to as the Edo Period. It is within this time frame and city that the evolution of ukiyo-e began. A rise in popular literature among the merchant class led to a break with religious prints and a shift to secular prints. One of the greatest contributors to the emergence of woodblock printing from the woodwork of obscurity is Hishikawa Moronobu (1615-1694) who succeeded in the production of simple but elegant single-sheet impressions in black and white. His prints ranged from festivals to erotica and introduced the notion that pictures could exist independently from accompanying text to be appreciated as art. In the early 18th century, color began to be applied by brush and then one or two color blocks. In 1765, the transition to full-color brocade printing took place with the application of polychrome woodblock techniques first by artist Harunobu Suzuki, in the form of a calendar. The result is described by Yoshida and Yuki as “unsurpassed in its harmonious use of various colors and in its fine delicate lines” (20 Yoshida). This is the final technical advancement that harkens the birth of ukiyo-e (Yoshida and Yuki 19-21). The world in which ukiyo-e was born was dominated by the warlord government of the shogunate. The Tokugawa implemented a social system of shinokosho, which stratified society into four recognized classes of people in the following descending order: warriors, farmers, artisans, and merchants. Each strata of the shinokosho provided a service or product to society except the merchant class (chonin) who created nothing and lived parasitically off of the exchange of goods (Kita 28). Chonin controlled a large portion of wealth but were denied political power and legitimacy. Considered oppressed due to numerous laws and restrictions, the government of the Tokugawa realized the need to provide a “safety valve” to release the resentment built amongst the chonin in such an obstructed society. This safety valve would become known as the floating world (ukiyo-e) which included the Kabuki Theater and Yoshiwara district where laws were not enforced and the chonin could be free. These attractions became the center of chonin culture and from this culture the ukiyo-e print was born (Kita 29). These popular pastimes of the floating world turned into popular artwork meaning to capture the fleeting scenes of a social class and appealing to more facets of the population than any preceding art. 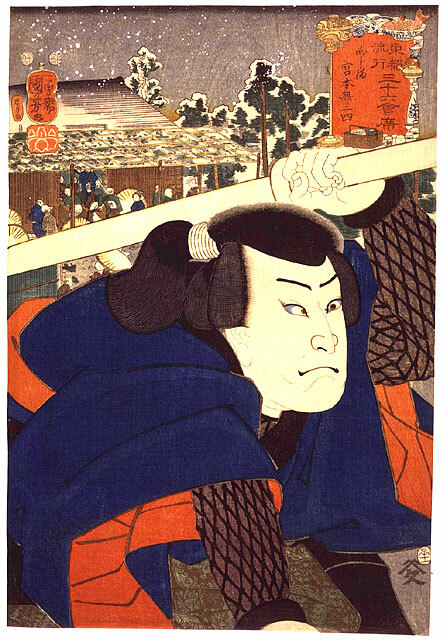 The three main subjects of ukiyo-e prints are the Kabuki Theater, Yoshiwara district, and landscapes. The theater and brothel culture served as both an outlet for chonin to flaunt their wealth and alleviate frustration with the social order. At the theatre chonin could patronize actors and fund productions (Kita 38). Kabuki theatre is a type of Japanese theater comprised of sixteenth century songs and dances originally performed by women and men and then later exclusively by men. Lasting for hours the Kabuki drama is saturated with action, numerous props, and elaborate costuming. Dress, poses and gestures are highly stylized and the actors’ voices are trained according to defined systems of modulation. Portraits of famous actors and elaborate play scenes with props and costumes began to be produced. These were often done in a close-up fashion and exaggerated facial expressions (Adams 810). In the Yoshiwara district, wealth could purchase female entertainment from the finest (oiran) to the lowest courtesans (teppo) and gave chonin an opportunity to act in the role of the aristocrat, quoting literature and commissioning art (Kita 39). These courteasan beauties took center stage in the prints and set the standards for popular trends with fashion and elegant poses. Their images reflect an expression of mood and personality shown in facial expression. Both of these images were highly idealized and fantasized to meet the current aesthetic. 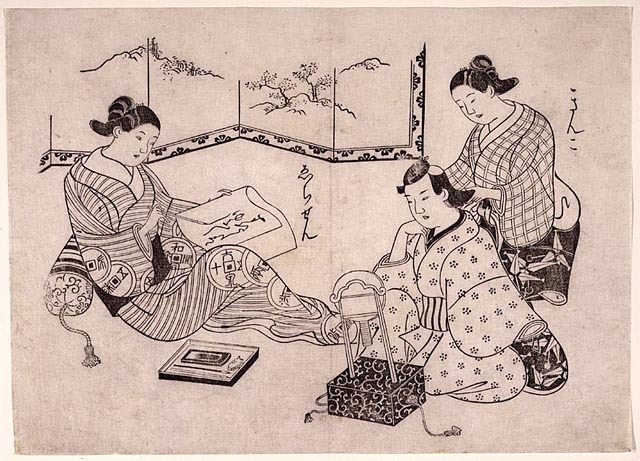 Common scenes were also captured such as domestic activities, festivals, even laundry (Kita 53). In the second quarter of the nineteenth century landscapes, which were once considered mere background, began serving in the foreground to illustrate man’s place with nature. In the traditional Japanese view humans do not control or attempt to dominate nature, but instead attempt to live in harmony with all other creatures and natural forces of the earth. This is especially exhibited by Katsushika Hokusai (1760-1849) one of the most famous landscape artists of the 19th century whose Great Wave of Kanagawa is most recognizable. There is a dramatic feel in the rise of the wave so close to the picture plane towering above the men in boats who seem to bow to the wave (Addiss103-104). This wave represents a temporary peak, which will fall in an instant but Fuji in the center of the background remains, which is often linked, to Japan’s sense of nationhood and patriotism (Baird 34) The other famous landscape artist Utagawa Hiroshige (1797-1858) produced a series of travel prints featuring the road between Edo and Kyoto, the Tokaido. As more people began traveling this road from all walks of life, prints were created for them to serve as souvenirs, records of travel, or even postcards. These memories represented the spirit of Japan from the point of view of the lower classes throughout seasons, weather, and times of day (Addiss 103-109). A Buddhist dissection of the term ukiyo-e reveals two seemingly incompatible definitions: the floating world and the sorrowful world. The floating world of pleasures does not appear to be sorrowful at all however in a strictly Buddhist sense, a connection is discovered through confronting the outlook on death. For most humans, there is fear in the mystery of death and afterlife and one instinctually clings to the material world. There is no afterlife in Buddhist teachings; Buddha warns against clinging to life because of its temporary qualities. Only sorrow results in humans’ futile decision to attempts to maintain what naturally disappears. Thus the connection of the floating world where one turns to the present transient pleasures of flesh and material are by definition also a sorrowful world (Kita 56). This ukiyo-e world is symbolically marked by the cherry blossom whose beauty may only last a few days before being destroyed by rain or wind but are admired for their impermanence and appreciated for their beauty. Incidentally the type of wood traditionally used to carve woodblock is cherry (Addiss 99). From 1853 to 1854 Commodore Matthew Perry, a United States naval officer led an expedition to Japan ending its policy of isolationism and opening ports. Exposure to the west led to the exchange of culture as well as goods. In the West people became infatuated with all things Japanese. In 1867 various Japanese woodblock prints were displayed in the Paris Universal Exposition. As a result of this contact a trend know as japonisme, the French term for the Japanese aesthetic, became popular in fashionable Parisian circles and greatly influenced Impressionist painters most considerably in the United States and France (Adams 809). Stylistically speaking the ukiyo-e print possessed distinct Asian qualities that were adopted and adapted by Western painters. Ukiyo-e prints were distinguished by oversized monumental figures filling the entire composition to really bring the view into the picture. Gestures and poses were highly stylized with elongated features distinguished by delicate black contour lines. The perspective often times offers multiple viewpoints at once and disregards traditional three dimensional space as depicted in Western art for flat one-dimensional work. 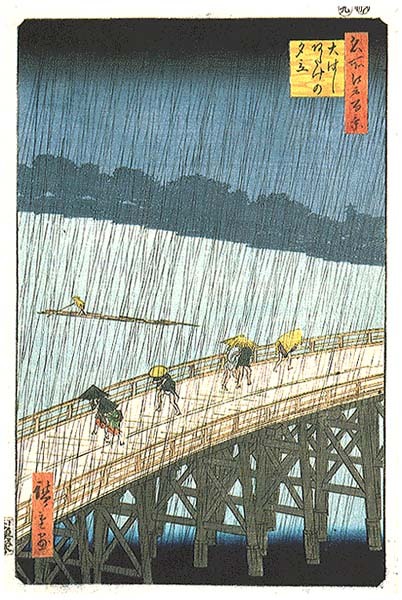 The strong diagonals greatly influenced the work of Van Gogh as is seen in Japonaiserie: Bridge in the Rain 1887 after Utagawa Hiroshige’s Sudden Shower at Ohashi Bridge at Ataka from the series One Hundred Views of Edo of 1857 (Adams 846). Here one sees the influence also of the West on East with a linear perspective of the one-point perspective. Filled with bold color woodblocks contain spectacular costuming with amazing attention to detail of patterns in which the Impressionist Mary Cassatt took an interest (Adams 822). The Impressionist movement of 1860-1920 was centered in Paris and was the antithesis to the preceding period of Realism. Impressionists preferred to exchange their ideas in Bohemian surroundings of cafes and bars because their movement was initially seen as a challenge and was rejected by the Academy. So too was the ukiyo-e print a first viewed as an illegitmated trend separate from the sophisticated upper class. Being the first Japanese art form to transcend social status ukiyo-e became popular amongst people despite education or income level. Impressionist works were consistent with the ukiyo-e, depiction of genre subjects most especially scenes of leisure activities, entertainment, and landscapes. Impressionists took interest in the effects light had in varying weather conditions, seasons, and time of day on subject matter as seen in the Hokusai’s landscape series Thirty Six Views of Mt. Fuji where scenes in different or similar views of the same place (Mt. Fuji) at different times of the day and different seasons. Both movements’ compositions are chopped off and asymmetrical which allows the viewer to feel as if included in the image by catching a scene in motion similar to the photograph snapshot. Impressionists began experimenting with a focus on flat color and patterns and different poses inspired by woodblock patterned fabrics (Adams 805, 810-814). The development of the polychrome woodblock technique and the brocade print paved the way for graphic design today. No graphic design will ever compare to the unique and unprecedented style of the ukiyo-e. After 1868 with the restoration of imperial power and the Meiji government there was a decline in standards of quality and intinuity of the prints. How appropriate then is the artwork of this period. Created with the impermanent sentiment of modern day posters or post-cards and this art was distributed indiscriminately to the masses who could afford them. Many of the most famous and beloved woodblocks were reproduced until worn out. The artists and patrons of sophisticated renderings of an undistinguished class were unaware of the effect these prints would have on the world of graphic design. They influenced the Impressionist movement and established a tradition uniquely Japanese. It is fascnating to realize the resonating effects the social restrictions placed upon the large body of merchant class. Without the deliberate seclusion of the merchant class this world would never have flourished and the art work would never have been created. Adams, Laurie Schneider. Art Across Time. New York: McGraw Hill, 2002. Addiss, Stephen. How to Look at Japanese Art. New York: Harry N. Abrams, Inc., 1996. Baird, Merrily. Symobls of Japan: Thematic Motifs in Art and Design. New York: Rizzoli International Publications, Inc, 2001. Kita, Sandy. “From Shadow to Substance: Redefining Ukiyo-e.” The Floating World of the-e New York: Harry N. Abrams, Inc., 2001.
http://www.artgallery.sbc.edu/ukiyoe/historyofwoodblockprints.html- Brief historical overview and summary of major artists. 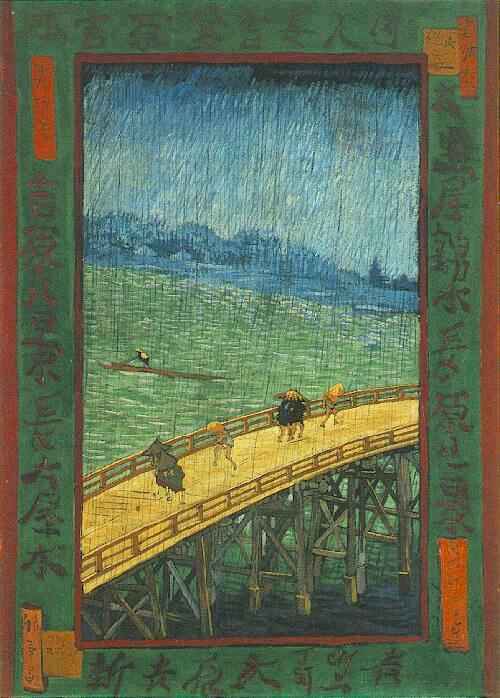 http://www.bc.edu/bc_org/avp/cas/fnart/amico/images-disabled/japan/japonisme.html - Nice comparison of Western Impressionist works and Japanese woodblock prints.